The worst enemy you can face when out hunting is glare. Because light tends to reflect off the surface of lenses, it reduces image quality and makes it difficult for you to hit your targets with accuracy. In a bid to overcome this problem, the Leupold engineers developed their own proprietary superior lens coating system which is utilized in the Leupold 115387 riflescope. The scope’s multicoated 4 lens keeps image quality pristine by increasing the amount of light that reaches your eye, and minimizes the reflection of light on the outer eyepiece. Therefore, you’ll have a clear view of your targets and surroundings at all times. Another Leupold proprietary technology used by this scope is the 2nd generation Argon/Krypton gas blend waterproofing technology. This gas blend technology is superior to the commonly used dry Nitrogen waterproofing technology in two ways. For starters, Krypton/Argon molecules are larger than nitrogen molecules, meaning they can sustain their attributes over a broader temperature range. This therefore means that the Leupold 115387 riflescope remains waterproof at all times since the Krypton/Argon molecules are resistant to diffusion and leaking. 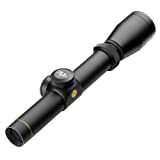 Secondly, the Krypton/Argon makes the Leupold 115387 Rifle Scope resistant to thermal shock.